A Blog Of Ice Cream: English Seaside Ice Cream, Hogwarts Castle & Craster Cornets! English Seaside Ice Cream, Hogwarts Castle & Craster Cornets! Ice cream has lots of traditions - from the way it's made to the way it's served and lots more. What I find interesting is to look into what makes ice cream 'traditional' to any particular geographical area. It might be the quality of the local milk, the type of locally grown fruit that is available or, if it's an area that attracts tourists, it might even be that the ice cream is produced especially to cater for the tastes of the 'incomers'. The truth is, like with all things ice cream, there are many variations on a theme. In England, for example, ice cream is produced by a wider variety of people than ever before. You have the traditional, small, local companies whose family have been making ice cream for years (such as is sold at the tea rooms next to Lanercost Priory in Cumbria) but also there are many dairy farmers now turning to producing their own ice cream which they sell direct to retailers and sometimes even directly to the public from their own ice cream shop. One tradition, however, that is thankfully still alive and kicking is that of the ice cream parlour though it is by no means thriving. The most common and indeed most popular is the traditional 'seaside' ice cream parlour (in the States they're called ice cream parlors of course). I have many happy childhood memories of them on the Yorkshire coast (Scarborough especially) and in more recent years have found others such as when I visited thre great medieval Alnwick Castle - or Hogwarts Castle as many now call it (the Harry Potter movies were filmed there) in Northumberland. 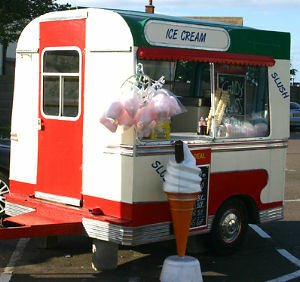 NOTE: There is some great Northumberland ice cream - if you ever plan a visit there, you should read more! Alnwick Castle is not far from the beautiful Northumberland coast with its sandy beaches, great vistas and fascinating history and wildlife. So a lot of visitors to the area, especially from the USA, enjoy the best of both worlds by staying in Northumberland cottages. After visiting Alnwick we called in at Bamburgh to see the magnificent Bamburgh Castle and then at Craster where we took the wonderful walk up to the ruins of Dunstanburgh Castle, a fabulous medieval castle in a location that defies description (once up there the views take your breath away!). After Craster it was Seahouses and there we found some great traditional English ice cream, produced locally and served from an old fashioned ice cream trailer (see photo). We plan to go back some day, possibly staying in one of the many Northumberland cottages that are available in the area. It might be a Seahouses cottage, a Boulmer cottage, a cottage in Craster cottage or even something in Alnwick or Bamburgh.